American and British currency are both good for bypassing level restrictions. 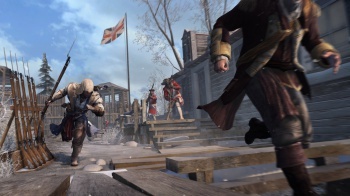 If it's anything like the previous titles, Assassin's Creed III will probably justify its $60 price tag with a lengthy campaign, tons of side missions, and extensive multiplayer options. However, Ubisoft sees no reason why it can't ask a few dollars more of those willing to pay. As of this week, players can purchase "Erudito Packs" with price tags ranging up to $20 in order to unlock multiplayer content for the soon-to-be-released title. The Erudito Packs, so named for an enigmatic supporting character in the Assassin's Creed series, will allow players "to acquire some game items, disregarding your current level." Whether they can also be used for single-player purchases remains unknown at this point, but Assassin's Creed III has its fair share of DLC slated for the near future, so it's not impossible. The cheapest pack, weighing in at 80 Microsoft Points or $1 on PSN, will give 20 units of Erudito's currency, while the heftiest will set you back 1600 MSP or $20 and net you 925 of them. Alain Martinez, Ubisoft's CFO, addressed the possibility of adding microtransactions to Ubisoft games in a previous interview: "[In] the future ... we could see more opportunity for $60 games to learn from the free-to-play model," he said. "The next generation will offer more and more item-based content. This will benefit our games' profitability." Apparently, the next generation is already here, but Ubisoft will have to wait a few weeks to see if its earnings respond accordingly. It's hard to find fault in Martinez's logic; after all, the operational cost of hosting microtransaction DLC packs is almost nil, so even a relatively small number of consumers should make the venture profitable.